Have you ever dreamed of having a personal tropical getaway in your own home or business? Having a Luxury Aquarium by Magnificent Aquariums is the easiest way to bring an exciting and unique fish tank experience home. We have proudly been designing and creating a variety of custom aquariums for over 25 years for upscale private residences and exhibition type facilities. If you have any interest in creating your own luxury aquarium – call today. We also offer every type of fish tank service that will help keep your tank running in optimal conditions. Studies have shown that having a pet like a cat or a dog can increase your health and overall life expectancy. Lately, there has been a newcomer to this scientific study – those with a custom fish tank or luxury aquarium are reaping these extended health and lifespan benefits. No one really knows the exact reason why there is a health gain benefit for having a common household pet. Same goes for the fish tank but one can imagine the escape from reality is a huge factor. When you arrive home and instantly become immersed in your tank thus melting away the stresses of everyday life and forget about going through the everyday repetitive doldrums. Luxury Fish Tanks are more versatile than ever and can be designed together with you in just about any way imaginable. 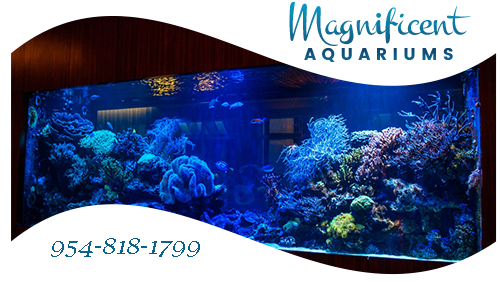 Magnificent Aquariums has designed many award winning creations in luxurious residences and for world class zoos. If you think it – we can design that perfect luxury aquarium of your dreams. The most beautiful saltwater tropical fish will perfectly complement any luxury aquarium.